When it comes to kids (and adults as well, for that matter) the Internet offers a mixed bag. When it’s good, it can be very, very good, and when it’s bad, it can be horrid—to paraphrase Longfellow. Parsing through content to find the good can be a challenge for parents, but YouTube, when used judiciously, can be an excellent source of inspiration and knowledge for kids and adults alike. A child with a penchant for creating and crafting, for example, can develop his or her skills by learning from some of the YouTubers who are putting out great content. If you’ve got some crafty creatives at home, here are a few YouTube channels worth checking out. Art for Kids Hub features the “Hubs” family—Rob, Teryn, and their four children—who seems to be having a lot of fun creating kid-centric art tutorials. 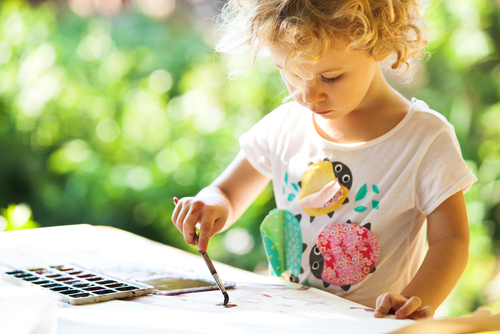 With videos like “How To Make a Pinch Pot for Kids,” “How to Draw Snoopy and Woodstock,” and “How to Finger Paint a Unicorn,” kids can find fun projects to fit their taste. Each video features Rob teaching, step-by-step, one of his children how to complete each project. Great for young kids, the videos are easy to follow and the projects are simple. Rob and his family exude positivity and encouragement throughout. They are quite prolific as well, uploadinga new video every weekday, Monday through Friday. The mother-daughter team of “Froggy” and “Little Froggy” host the most popular channel on this list—My Froggy Stuff. This doll-centric channel features some jaw-dropping crafting videos that result in furniture, accessories, fashions, and entire rooms for Barbie, American Girl, Calico Critters, and other popular doll brands. If you have children who love dolls and love to craft, this is the channel for them. The craft-centric videos include “DIY – How to Make: Hello Kitty Doll Room,” “DIY – How to Make: 5 Easy Magazine Crafts,” and “How to Make: Custom Made to Move Royal Wedding Meghan Duchess of Sussex Doll.” In addition to fantastic projects, the inspiration behind their channel, and how lovely the family is, make My Froggy Stuff worth watching.